Wondering if you’re presenting yourself to the public in a way that brings God glory? Find what you need in the Fan Service and Image chapters. Want to support them in their efforts to share their faith? Try Social Media, Sharing God with Others, or Taking a Stand. 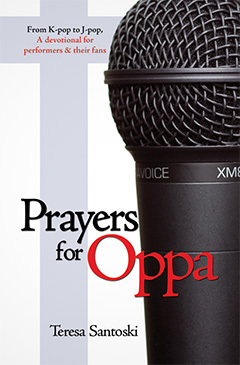 With its emphasis on cultivating a strong relationship with God through prayer and reading the Bible, Prayers for Oppa offers performers and fans a more meaningful connection with one another and with God. It is an excellent tool for small group studies (especially when combined with the Prayers for Oppa Performer Prayer Challenge) as it offers a unique way to deepen one’s relationship with God and share Jesus with others. Prayers for Oppa is available in print, ebook, and audio formats. For purchase information, click here. Have a prayer request for a performer? Email me at prayersforoppa[at]gmail.com or contact me via the Prayers for Oppa Twitter account. I’ll pray and share your prayer request online so that others can pray as well.